The Galco Stinger belt holster was designed with the KISS principle in mind. Made to carry a small semiautomatic pistol or double-acton revolver behind the strongside hip, the Stinger's open top and forward cant allow a fast, easy drawstroke. Safety, security and stealth are all addressed with a covered trigger guard, deep molding and a tunnel-style belt loop that takes up little belt space compared to a pancake-type holster. The Galco Stinger is constructed of premium saddle leather, fits belts up to 1 ½" wide. Holds my hand gun nice and snug. Nice leather. Perfect, simple and low profile. 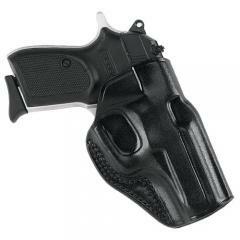 Perfect, this is for an off duty gun and the off and on is great with less bulge than the paddle holster. Overall good carry, compact light. Not as tight of fit as I had hoped but serves the purpose. My 6th stinger. Sig239, 938, Colt New Agent, Wather PPK, and now a vintage Model 36 Chief's Special. Holds the sidearm close, perfect cant, holds securely and draws fast. If they are tight for your piece, spray a light 5050 alchohol and water on the inside. Let it soak for 5 min until it is dry appearing. Put som CLP on your piece and shove it in to its place. Let it set over night, spray with dry lube silicone the next day. It will fit, and your reward is a snap perfect minimalist rig that works. All day comfort. Nice fit but leather is a bit thin.